Now in 52 devotional readings, Holley shares with women the answer to the restlessness they feel in their hearts that keeps them hurrying, striving, pushing. She shows them that "the God who scattered stars like diamonds across the velvet of the universe, the keeper of every sparrow, the maker of us all, is inviting us to draw closer to him. He is the place where our hearts can go on the hard days and the happy ones, in the highs and lows, when we are sad or frustrated or downright giddy. He is what we've been searching for all along." I love reading all of Holly Gerth's books! They are always so encouraging, full of Godly wisdom and great for any season in your walk with God. This book can be used as a great devotional or gift book to gives to friends, co workers or a family member. 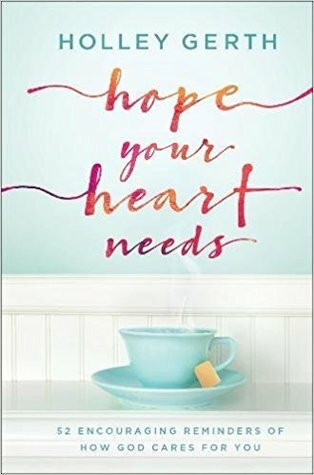 Holly uses the character of God to draw into the reader into thought provoking, diving deep into the Bible. I was very encouraged by this book and thought of several people that I needed to purchase this book for. I really enjoyed reading this book and am going to pick up a couple of copies for a few friends. I give this book 5/5 stars. Holley Gerth is a best-selling writer, licensed counselor, certified life coach and speaker. She is cofounder of (in)courage, an online destination for women, which received more than one million page views in its first six months. She also reaches out to readers through her popular blog at www.holleygerth.com and a partnership with DaySpring.